"Every time I step into OMSI, I'm fired up," Janet says of her role as a volunteer at OMSI. Back in 1968, Janet started leading school tours at OMSI, a role that morphed over the years into many different volunteer positions and many memorable experiences. Growing up in the Salinas Valley in Monterey County California, Janet developed a love of building community. She continues to visit the oft immortalized region of her childhood, where friends and family still reside, sharing her experiences at OMSI and beyond. "Invest in something you admire," Janet lauds, and "community will grow." Janet has volunteered at OMSI on and off for 49 years! She enjoys interacting with OMSI's young visitors because she learns as much from the children as they may learn from her. Volunteering also forces her to move out of her comfort zone to meet new people-some of whom have become her good friends-and learn new skills. "I'm getting away from my element, which is really good for me," she says. The hardworking mother brought her son to OMSI all the time. He especially enjoyed the summer classes. Now she visits with her grandchildren. Janet sees OMSI as a catalyst for creating so many opportunities, not only for her family, but also for the entire state of Oregon and beyond. OMSI is a positive force in the community that she calls home, an institutional gem she has enthusiastically supported. Janet sees her volunteer responsibilities as one way to support OMSI, but she also discovered another way. She made a planned gift through her estate plan to support OMSI because it has been a focus most of her adult life, where she made life-long friends and inspired so many people to learn. "It is an institution that I want to see continue to grow and thrive. It needs external support and can't go on without the financial support from people like me," she explained. She is excited to be one of OMSI's longstanding volunteers. 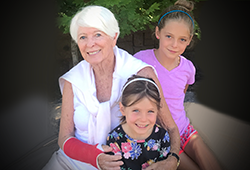 A long-time tennis player, her non-volunteer time is spent with her husband Bill, dog Riley, and grandchildren. A childhood in Monterey County spurred a love for John Steinbeck's writing. Known by many to have an extensive collection of Steinbeck books and memorabilia, Janet's life journey is summed up by a quote from the famed author: "We don't take a trip; a trip takes us." Her volunteer "trip" has definitely taken her. To learn more about how you can make a planned gift to OMSI and become a member of the J.C. Stevens Legacy Society*, please contact Catherine Ingvaldsen at (503) 797-4571 or cingvaldsen@omsi.edu. *The J.C. Stevens Legacy Society, named after OMSI's visionary founder, recognizes donors who have included OMSI in their estate plan. We are pleased to extend special invitations to exclusive OMSI events and private tours to Legacy Society members. All you need to do is tell OMSI that your plan is in place and that you are willing to be publicly listed on the J.C. Stevens Legacy Society honor roll, setting the example for others to follow. If you wish, your gift can remain anonymous.